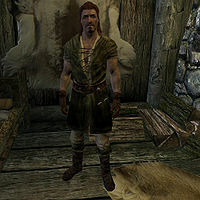 Lodvar is a Nord lumberjack who lives in Dragon Bridge at Horgeir's House. He is the brother of Horgeir, who runs the mill. They disagree on whether they are deep in debt or if business is booming. Lodvar begins a long day of work by waking up at 8am and walking down to the mill. He works tirelessly at the mill, loading logs to be chopped by the mill until 6pm. He then walks back up to Horgeir's house and cooks a meal at the cooking pot in the house. Tired from working hard at the mill all day, he goes to bed at 10pm. Lodvar wears clothes, boots, and gloves. He carries Horgeir's house key and some common loot and gold. In combat, he relies on an iron dagger. When approached, Lodvar has little interest in talking, saying, "Keep walking, stranger." He assumes you're looking for some free items, stating, "If you're looking for handouts, look somewhere else." and "Got nothing to spare for travelers nor refugees, here." He then will offer some advice, "You want anything in this life, you gotta take it. Just not from me." Lodvar: "I'm thinking of going for a walk up the mountain later. Would you like to come?" Olda: "Oh, that sounds nice. Yes, I think I'll join you." Lodvar: "I'll bring a blanket and some wine." Horgeir: "One of these days, we'll have to find you a good woman like my Olda." Lodvar: "Yes, I think I'd enjoy a woman like your wife." Horgeir: "Well then, it's too bad my wife is already taken." Lodvar: "Yes, it's a great shame. Gods willing, I'll find someone just like her one day." This page was last modified on 9 January 2018, at 19:24.